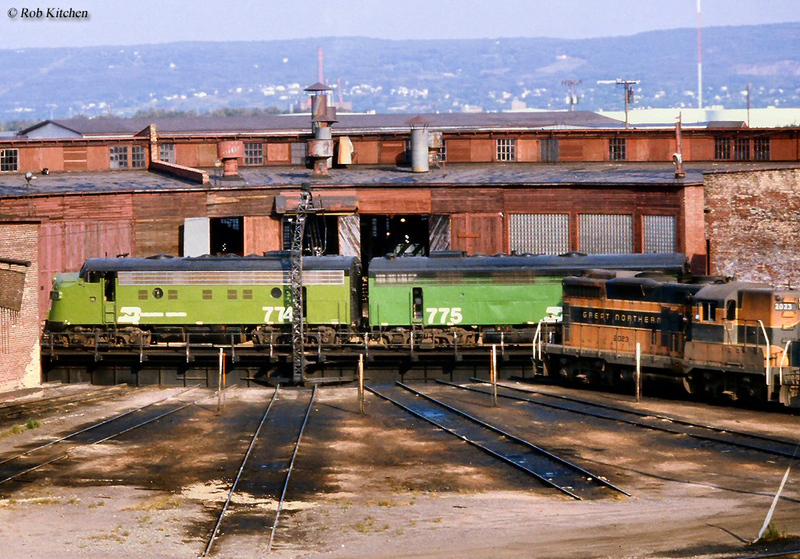 The roundhouse's unique circular design was comprised mostly out of redundancy, built around the turntable to easily and quickly turn locomotives. Of course, the complex is nearly synonymous with the steam locomotive and following the arrival of the diesel, steam was not only silenced but the new motive power also led to the demise of the roundhouse. The building was mostly rendered obsolete since diesels could operate in multiple directions and also allowed maintenance facilities to be placed much further apart. 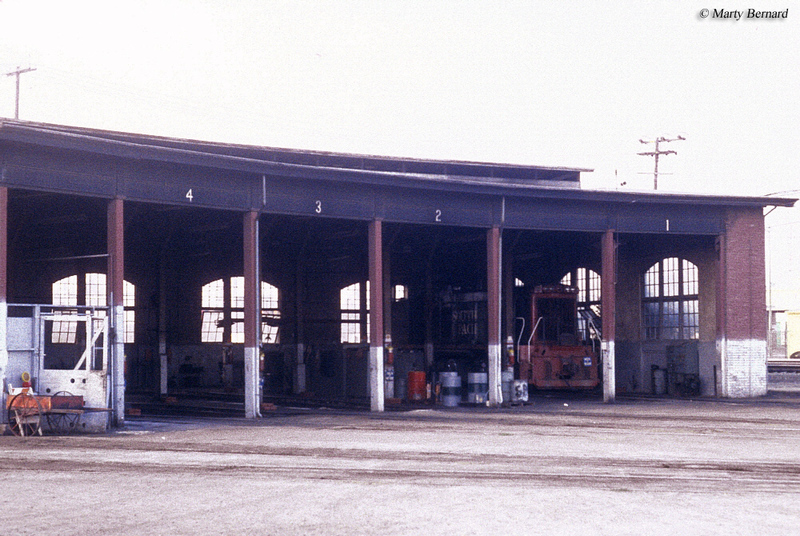 The engine house, as it was also known, continued to remain in use to some extent during the diesel era but by the 1980s most had been abandoned or torn down. Today, you can still find a few serving in their original capacity although most still standing are either derelict or preserved such as the Baltimore & Ohio's Mt. Clare roundhouse (designed by Ephraim Francis Baldwin), now part of the B&O Railroad Museum. The roundhouse dates back to the early years of the railroad industry with the first known of its kind said to have been built in Derby, England in 1839. As steam locomotives grew in size so did the building. 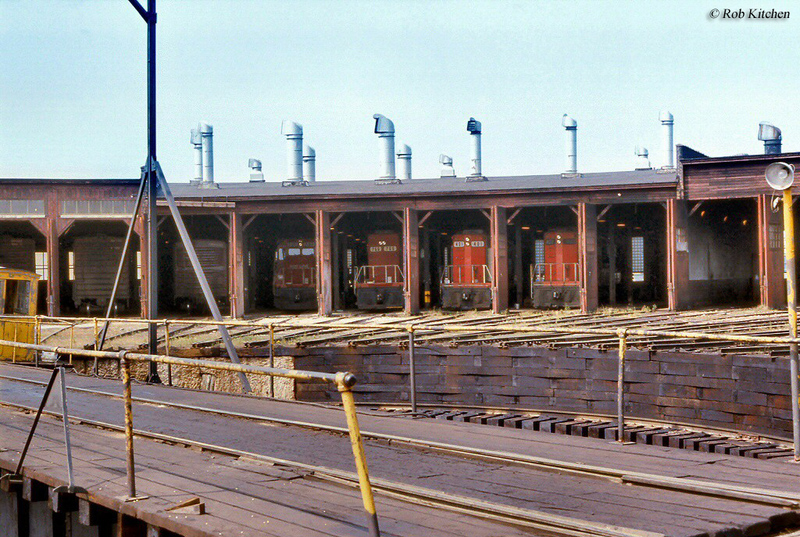 Early roundhouses were designed with only a few stalls, while newer structures could hold more than two dozen steam locomotives and acted more like a warehouse than a maintenance/storage building. Steam locomotives, devices that would literally drive and power the American railroad industry for its first 130+ years of existence actually has its origins in England. Originally built by Richard Trevithick and Andrew Vivian in 1804 for the narrow gauge Penydarren tramway in Wales the contraption was first tested in America in August of 1829 when Horatio Allen, a chief engineer for the Delaware & Hudson Canal Company (later the Delaware & Hudson Railway) tested an early English steam locomotive design on a 16-mile stretch of track the company owned between Honesdale and Carbondale, Pennsylvania. The locomotive used was named the Stourbridge Lion, which was a very simple two-axle machine with a vertical boiler, and it was employed to move coal from the mines at Carbondale to Honesdale. Until the 20th century virtually all steam locomotives coal as their primary fuel source (although very early designs, like 4-4-0 Americans used wood) with large tenders of water to produce the necessary steam. The operations of steam locomotives are relatively simple, which I will try to explain just briefly. Fuel, usually either coal or oil, is fed into the firebox where the resulting hot gas enters boiler tubes, known as flues, to heat the surrounding water turning it unto steam. From this point the steam is fed into the pistons whereby it expands and drives the steam locomotive’s rods (those massive steel shafts which are attached to the wheels) and propels it forward. The hot gases are then carried into the smoke box where they are funneled into the smoke stack and out of the locomotive. A quick note about the "modern" steam locomotive smoke stacks, most carry grating or some other type of screening to help reduce the amount of cinders (especially in the case when wood was used as fuel) which are projected into the air and can cause brush fires. The roundhouse's primary function was for storage and maintenance of steam locomotives. However, since most steamers operated in only direction, forward, turntables were placed front and center of the roundhouse. So the building not only performed light maintenance duties but also allowed the locomotives to be turned if needed and the semi-circular design made things that much easier. Unfortunately, the roundhouse was a very costly maintenance expensive since steam locomotives had to stop often to refuel and required many more man-hours to maintain than diesels. Because of this virtually every yard across the country contained a roundhouse of some size to provide general locomotive maintenance and turn them if needed. However, by the dawn of reliable diesel locomotives in the late 1930s and early 1940s it was clear that not only steam was on the way out but also their homes, the roundhouse.While the building continued to be used through the 1950s, '60s, and even '70s by the 1980s it was more of an endangered species than an everyday aspect of railroading. Since diesels required much less maintenance and could operate in either direction there was little need for a dedicated maintenance facility and turntable every 100 miles or so. When required, railroads found it much easier and less expensive to turn locomotives by using a "wye", or a "Y" shaped track that branched from a spur or main line and allowed the unit to be facing the opposite direction once it had returned back to the track from where it had started. Today, you can still find not only preserved or standing roundhouses but also "new" versions of them. Railroads still use the building's function as means to get locomotives out of the weather and for minor maintenance issues but today they are more commonly known as engine houses and can be just a single stall or a large warehouse-type building on Class I systems. For Class Is they are usually based within a major engine terminal so as to consolidate as much maintenance into one confined location as possible.